Photo credit: Newsbeezer. Baby Alex undergoes transplant at Rome's Bambino Gesù Hospital. 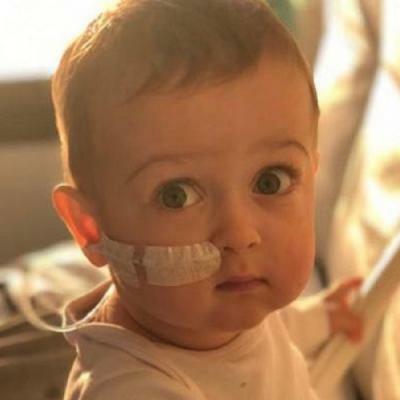 ROME - Baby Alessandro Maria Montresor, who has been in desperate need of a bone marrow transplant for some time now, was reportedly operated on at the Vatican’s Bambino Gesù hospital earlier today. “Alex has undergone a haematopoietic stem cell transplant,” a source at the hospital confirmed. Alex was born with reactive hemophagocytic syndrome, a rare genetic disorder. An urgent appeal was launched to find a bone marrow donor for him in late 2018. It garnered attention in both Italy and the United Kingdom, for Alessandro was born in London and his parents still live there. Though a donor was found in late November, he would reportedly only be available from Jan. 2019. At the end of November, London’s Great Ormand Street Hospital proposed Alex’s transferal to the Bambino Gesù Hospital in Rome, which is reportedly a proponent of one of the most innovative bone marrow transplant techniques in the world. The hospital declared that the bone marrow of either of his parents could be used for the treatment, and over the past few days “have organised screenings to identify who would be a more suitable donor.” According to the hospital’s most recent statement, Alex’s father was chosen. At just nineteen months old, the baby has reportedly undergone therapeutic treatment to destroy the cells carrying the genetic defect. His father’s cells were manipulated using scientific techniques and then inserted into the baby. For now though, it is a waiting game. Doctors must keep a watchful eye over Alex’s wellbeing, and ensure that the transplanted cells are not rejected. All being well, it is possible that the process may be completed before the end of January.